I have been on this property at the head of the North River Valley in Waipu for the past 30 years. Having traveled extensively through Africa, Asia, the Middle East and Europe I returned home with the realisation that there was more to life than farming in general and milking cows in particular. I have an immense love of the land and of New Zealand, so moving from this special property was not an option. I particularly noticed the solitary lifestyle I had been leading, and realised that I needed to do something that involved people. About that time a friend invited me to go trail riding with her at a local riding center. I don't mind admitting that a didn't enjoy a single minute of it. Having been 17 years since I had ridden a horse I was definitely out of my comfort zone. However, the one thing that it did do was to reignite my childhood passion for horses and riding. Two years later, and no formal riding or horsemanship training, I had 10 horses and was open for business. Over the preceding 6 months before opening for business I rode all the horses that I acquired, for many, many hours, and to be absolutely truthful, the learning curve was very steep indeed. That was back in 1992, the horses are still training me in being a better person and I still look forward to each day with the enthusiasm of an adventurous child. For my life has turned into an adventure, the adventure of self discovery with 20 plus gurus out in the fields showing me the way. Now, having worked with over 25,000 people riding, it is time to use this experience for the betterment of horses and of people. At home on the farm we offer Equine Assisted Psychotherapy and Learning and Leadership and Profession Development trainings, as well run Humanship Horsemanship workshops and individual sessions. This has now spread nationally and internationally with travel to Europe each New Zealand winter. All of which is a far cry from even my wildest dreams when I purchased the property. For I believe that horses and nature can show us a better way of life, and teach us the life skills of communication, harmony and balance; thereby helping to create a better place for us all to live. Combining my passion for horses with my interest and studies in psychology was always my dream. With moving to New Zealand in 2009 and assisting in the Humanship Workshops throughout Germany and Scandinavia is where the cicle closes and my two passions come together. 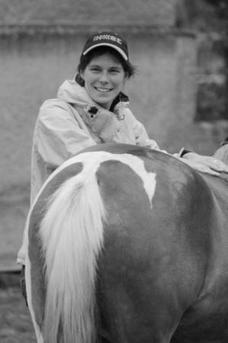 The love for horses lies within my family, so I started with dressage lessons in Pony Club in Germany when I was little. But it wasn't before I came to New Zealand on a school-exchange when I really learned how to ride and start building a relationship with a horse. Several years down the trek starting my psychology studies there was little time to follow my passion for horses. Before finishing my studies in work and organizational psychology I came over to New Zealand and worked as a horse trekking guide here at North River. Meeting Ian and learning from him about Humanship/Horsemanship changed not only my view on horses but also my life. Since then I have been fascinated how horses mirror us and what deep impact horses can have on us. During my Psychotherapy training over the last 3 years I can say some of the most indepth insights I gained in self-experience, humanship sessions and interacting with horses, listening and reflecting on the feedback the horses gave me. Through the European summer months (June till October) I travel with Ian, assist and translate in the Humanship sessions and Workshops. At home in New Zealand we both also work in the field of Equine Assisted Psychotherapy and Learning.